We Welcome You to Our Website! Thank you for visiting our website! 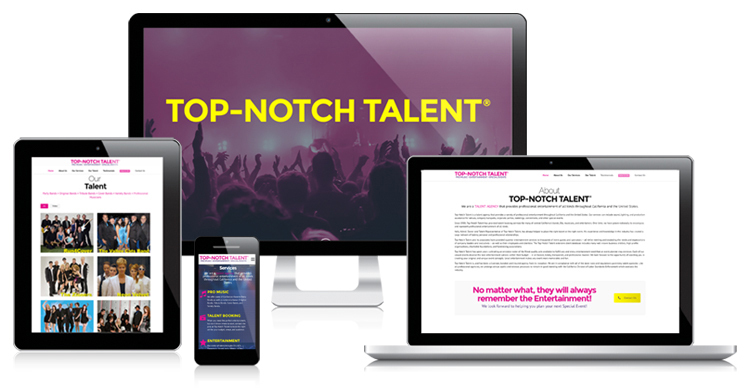 The Top-Notch Talent website enables our visitors to learn more about us and see examples of our entertainment. It will help those searching for fun and professional talent. We sincerely hope you like it as much as we do! We did not have to do it alone. We have been working with Chris and Jerri of GINGALLEY, LLC. They created our logo, cool graphic designs, and jumped in right away preparing all that we needed for a stronger online presence. They also helped to enhance our business with custom designed printed materials. Teamwork and dedication is what both of our businesses can be proud of. The goal of Top-Notch Talent is to help business owners, organization leaders, and event planners with their entertainment needs. The knowledge of having a smooth-running and well-managed event creates trust and an overall good time for all. It also is a relief to our clients in knowing that they won’t be surprised by more entertainment expenses than they budgeted for. Top-Notch Talent and its associates have provided superior service as a talent agency that provides a variety of professional entertainment throughout California and the United States. Our services can include sound, lighting, and production assistance for venues, company banquets, corporate parties, weddings, conventions, and other special events. Let us know what you think, and be sure to contact us when you need the perfect entertainment for your budget, venue, and audience. We can help you to create your memorable event with our consultation services and professional network of event service providers. Copyright ©2019 Top-Notch Talent® and Top-Notch Entertainment®. All Rights Reserved. | Web Design by GINGALLEY.